Crossed with Maris Peer, this new variety has a delicious flavour, producing generous yields of small, oval tubers with smooth white skin and firm, creamy flesh. Highly recommended for steaming and boiling and serving as a new potato, hot or cold, with salads and we’ve also found it roasts well too. 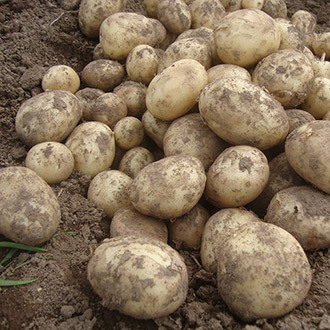 Exceptional resistance to powdery scab and blackleg.